Without consulting a crystal ball, Thomas Frey, executive director and senior futurist at the DaVinci Institute, writes and speaks about a promising future for those libraries strongly connected to their communities and quickly adaptable to the changing world around them. Tom Sloan, executive director of the DuPage Library System in Geneva, Illinois, asked Frey to discuss the future of libraries. Unlike many futurists, you have stated that “libraries are here to stay.” Why? Libraries have been around in various forms for nearly 4,000 years and have become a cornerstone of activities for the communities in which they exist. Even though the role and function of what’s happening inside will change, the library itself will remain a powerful entity around which communities will rally. Beyond the evolving nature of libraries, there are very few people who don’t like libraries. The library-hater crowds are very small. While some will argue about the value of dollars going into a library, not many have waged an all-out assault. On balance, the vast majority of people want libraries to remain, and this public sentiment will help solidify the staying power of libraries for many years to come. An important role of libraries that often gets overlooked is that of archiving the community in which they exist. While many forms of information can be digitized and reside in “the cloud,” and various devices will give us access to information anytime and anyplace, there are a variety of documents and artifacts that are necessarily local. I’ve suggested libraries install “time capsule rooms” as a way to help archive their communities. The more a library can do to establish itself as an archive of everything local, the better it will be at touching the hearts and minds of everyone it serves. You’ve said that within 10 years the ink-on-paper publishing industry will not be a sustainable economic model. What will the new business model be? In January I attended the Consumer Electronics Show in Las Vegas and saw over 20 new digital book reader products being introduced. Over the next few years we will see fierce pricing competition with the cost of book readers dropping to under $20. At the same time, the number of digital downloads, which cost a fraction of the price of traditional books, will soar, and the sale of ink-on-paper books will plummet. People today have grown to resent the one-way flow of information. They want to participate, make comments, interact with other readers, and somehow take ownership of the content. The most successful business models for future publishing companies will involve interactive forums where authors engage in give-and-take sessions with readers and the former static content of books takes on an organic life of its own, and continues to grow along with the discussions. I can only speculate on the most effective business models, but my guess is that readers will be willing to pay significantly more to engage in things like live webcasts, digital book signings, and vibrant talk-back sessions than they ever paid for books in the past. You have written and spoken about libraries becoming “Electronic Outposts.” What is an Electronic Outpost library? An Electronic Outpost is a satellite branch of a central library designed to be an efficiently run community gathering place. Size, shape, and purpose will vary. Some may fit well in shopping centers while others may be better suited to function as stand-alone buildings. Some may be very small, others quite large. Some will take on a homey, living room–like feel, others a more traditional library reading-room setting, and still others will opt for the look and feel of a cyber café. My hope is that communities will begin to experiment, and electronic outposts be synced with the needs of the surrounding community. In the end, they will serve a different role than that of a traditional branch library. The possibilities are endless. Some will offer a selection of digital tablets and book readers, other will feature mini-theaters, gamer stations, day-care centers, working studios, and search command centers. Even though the days of traditional books may be numbered, our need to access information will continue to escalate and our methods for interacting with the information will continue to evolve. What is the “Empire of One” business model and why should libraries be interested in this trend? An “Empire of One” business is a one-person business with far-reaching influence. Some exist as private practices like that of a doctor or dentist, others as coaching or consulting businesses, and still others as freelance service providers. A growing number have taken on massive operations with products manufactured overseas, customers all over the world, and a global customer base. Most work out of their homes. Much like the growing ranks of the telecommuters, they often feel isolated from the rest of the world and tend to crave meaningful conversations with like-minded people. An emerging new trend is towards creating what’s known as co-working spaces, which serve as social work environments for independent workers. Co-working spaces offer enough privacy so productive work can be accomplished, but also social spaces that allow sidebar conversations to spring to life. This is an interesting area that libraries need to experiment with. In the 2006 book The Long Tail, Wired magazine Editor Chris Anderson said, “When the tools of production are available to everyone, everyone becomes a producer.” What new roles and functions can libraries adopt to support producers? All around me I see people transitioning from consumers to producers. These “tools of production” that Chris Anderson talked about are now easily accessible. For libraries, the patrons are shifting from information consumers to information producers. Readers are becoming writers, audio listeners are becoming audio composers, and video watchers are becoming video producers. Libraries need to begin offering access to these “tools of production.” They may range from podcast studios, to audio capture and audio editing, to video capture and video editing, to virtual world stations, to blogger stations, to mashup consoles, to graphic editing stations. The possibilities are only limited by our own imaginations. In addition to libraries, you write and speak about the future of business, education, government, and transportation. What trends in these areas do you think will have the greatest impact on the future of libraries? Perhaps the biggest impact will come from tomorrow’s education systems. Future education systems will be oriented around an iTunes-like system that enables experts all around the world to create courses with a rapid courseware builder. Envisioned as a smooth, fill-in-the-blanks template process, the courseware builder will carefully step course producers through the design, build, and launch phases of each course. With courses stored as part of a global distribution center, they will then be made available to people all around the world. Apple has already launched iTunes U and is currently hosting over 200,000 college courses. These courseware builders will get far better over time, and it will soon be commonplace for kids of all ages to take the majority of their classes online. The future of education will revolve around hyper-individualized learning, self-paced, organically generated content that is modality diverse, and available on-demand 24/7. Any topic, anywhere, anytime . . . it will be less dependent on teachers, less dependent on schools, and offer more personal control. 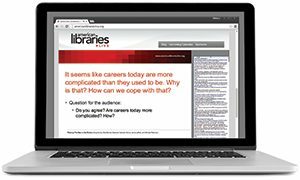 Libraries have the potential for becoming the working laboratories for people creating new courseware. Over the past few years you have visited hundreds of libraries and spoken to many library groups across the country. What have you learned about libraries that you didn’t know prior to your visits? This may sound a bit odd, but libraries are really a life form. They exist as a human system, and as such tend to take on many of the same attributes as other life forms. Going back to your first questions, libraries are here to stay because they have a survival instinct. They have created a mutually dependent relationship with the communities they serve, and most importantly, they know how to adapt to the changing world around them. Thomas Frey is executive director and senior futurist at the DaVinci Institute where he works closely with the institute’s Senior Fellows and Board of Visionaries to develop original research studies. As part of the celebrity speaking circuit, Frey pushes the envelope of understanding, headlining events with some of today’s most recognizable figures. 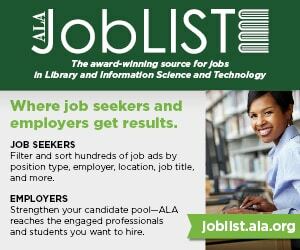 Tom W. Sloan is executive director of the DuPage Library System, a regional, multitype library system headquartered in Geneva, Illinois, consisting of more than 130 members in over 300 libraries in the greater Chicago area.